Spring Retry library (https://github.com/spring-projects/spring-retry) provides a declarative support to retry failed operations as well as fallback mechanism in case all the attempts fail. This article will explain step by step setup for integrate spring-retry in our spring-boot application. 2. The ApplicationService accesses the APIs of RemoteClientService and have the retryable context on it (ie if the access fails, then retry accessing it again as per retry configuration). 3. The LookupController exposes the rest API of our application, where we get a key as request param and return ait along with its value. Also it has 1 more method, ie fallback method. This method is called automatically when all the retries are exhausted. The signature of this method is same as the method annotated with @Retryable. 3. The arguments here are arguments for method with @Retryable + the exception. 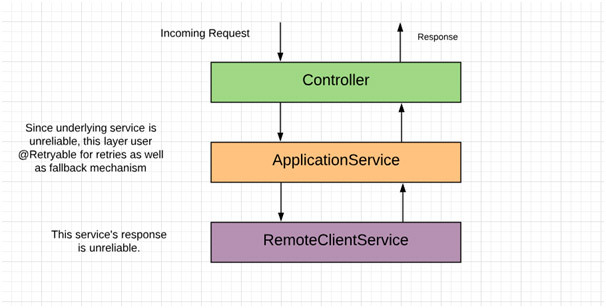 The Rest Controller exposes the single API (/lookup), which accepts a key and then calls the applicationService to get its value (which in-turn calls the RemoteClientService). In this case, the first call fails, but subsequent retry attempts fetches the response. Here the first call as well as subsequent retry attempts fail. Hence at the end the fallback method is called (one annotated with @Recover) which sends the fallback response to client. 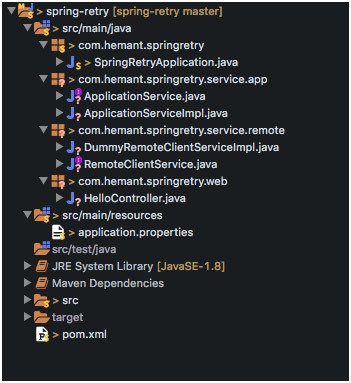 Thus we have created a java application development using spring-retry which provides us a declarative way to handle retries more efficiently.